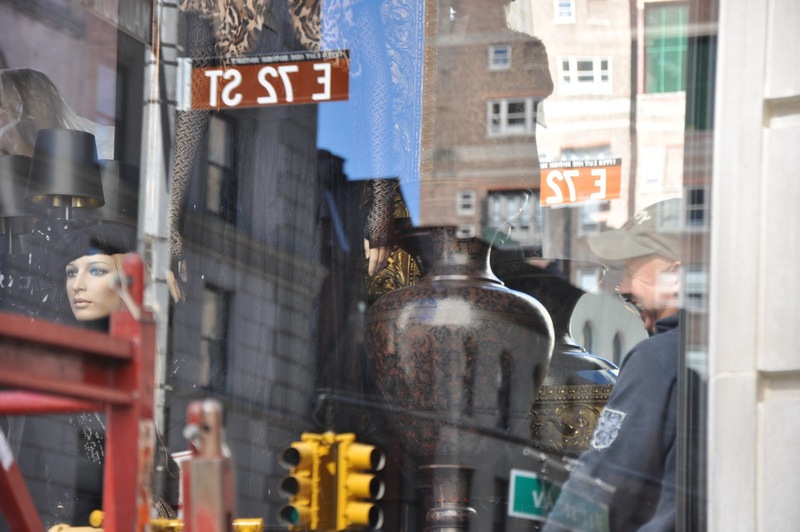 Something that’s starting to become one of my favorite things about New York is its role as a city of contrasts. On any given day, you’ll come across innumerable scenarios that seem paradoxical but somehow end up making perfect sense. Because it is so big, I find New York allows me to see the beauty in the everyday, the mundane and the contradictory, almost like a landscape photograph of a beach that upon closer examination is made entirely of fruit. This past weekend was filled with such contradictions. 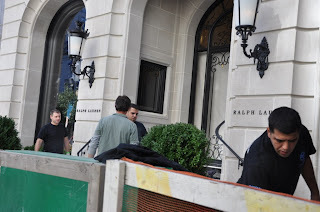 First, as I was walking to Central Park to see JA, HS, and HH (I will henceforth refer to the group as The British Ladies), I walked past the new Ralph Lauren store on Madison Avenue. Soon to have its grand opening, the store was still under some phases of construction. Workers in dingy navy t-shirts and jeans heaved wood from the sidewalk in front of the building, wiping sweat from their brows with canvas-gloved hands. Supervising the activity was the one man in a baseball cap, who sat inside a window display with a chicly attired female mannequin as if he was instead keeping the lady company. Ralph Lauren, known for his classic American leisure style, has probably never worn a dingy navy t-shirt in his life, and he certainly hasn’t heaved wood off of a sidewalk in a while. Nevertheless, men who might be unlike him in many ways slowly gave life to his new store, painting the inside displays, cleaning the windows and cleaning up the entrance to the premises. Sometimes what happens behind the scenes is more important than what happens in front of them. Then, walking along the oh-so-posh Fifth Avenue, cluttered with quiet mansions and apartment buildings of traditional gray stone and concrete, I stumbled upon the National Hispanic Day parade. 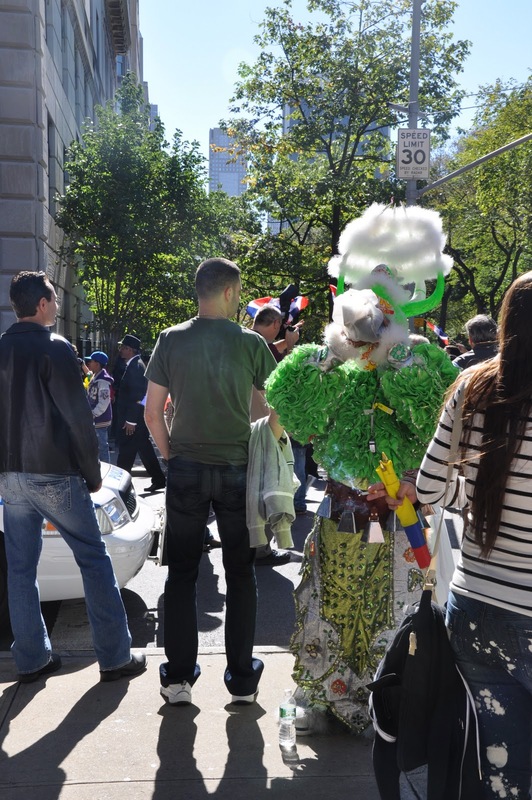 The parade was an explosion of color and sound, with each Hispanic country represented, its New York transplants delightfully waving flags down the avenue. People young and old in sparkling traditional dress waltzed along the street waving happily to watchers. As they exited the parade route, however, their smiles dissipated and they bent down to loosen their Nikes or Converse sneakers just a little bit to let their feet breathe. A man in full regalia ate a sandwich and sipped a beverage from a brown paper bag. Tattoos peeked out from behind a fallen shoulder of a dress. The costumed paraders almost instantly became human again when they were out of the public eye, perhaps as most people do. It’s almost like catching Mickey Mouse drinking a beer on the other side of the Disney fences (but definitely not upsetting). Maybe the biggest contrast of the weekend, though, was Central Park itself. Wandering through the seemingly endless green space with The British Ladies, I had a new appreciation for the park. I had been in it a couple of times, to the zoo, to the Obelisk and whatnot, but never an extended walk as this time. Grass laid over small twisting hills and curves, a path following its curves to anywhere you could possibly want to go. We found ourselves discovering many statues and landmarks along the way, from fountains, ponds and boathouses to oversized sculptures of Hans Christian Andersen and depictions of Alice in Wonderland. October’s early sunset slowly eased orange into the sky as we made our way to a castle overlooking much of New York’s East Side. Central Park is a gift to New Yorkers, who every day make their way through or underneath the concrete jungle. It is a taste of nature available at any moment. The park is almost overwhelmingly large—inside it feels like there’s no way you could possibly ever see all of it. Maybe it’s better that you don’t, though. New Yorkers have a tendency to be very “been there, done that” about some things, but Central Park is one place in a city of perpetual display that will always retain a sense of mystery. I don’t know if there’s a better contrast one could ask for.